Mike didn't go get the mail today, can you believe it? IT might be here! I'm writing this post about IT tonight because when IT comes I want to be ready. Maybe IT is in the mailbox RIGHT NOW? I'm talking about my tiny-tiny-not-worth-mentioning smidge-more-interesting-than-the-usual-that's-all secret I posted about so recently. Let me set the scene. You may remember, oh, weeks ago, when I was talking about how Mike didn't want to stay in a haunted room on the Queen Mary. He still doesn't, that hasn't changed. But, odds are that on our next DIsneyland trip (see, forgiveness toward the park creeps back in enough to entertain the idea), we'll go see the QM. This put me into research mode. I love research mode. I wish I could be in research mode all of the time. You just never know where it might take you. As you know, I collect used postcards. I love retro mode, too. And research and retro modes combined? Yum! 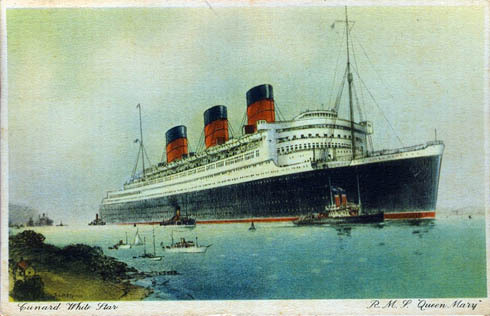 So, as I got revved up in my Queen Mary research, I decided to head over to eBay to scout for some vintage used QM postcards. Staying on the ship will definitely happen at some point, and I should start looking now for some cards to add an extra historic vibe to that future trip. There were plenty on auction, all in the usual price range of "really?" to "uh, no." One seller in particular had four QM cards from his aunt's estate. Since there were four, I assume she just fancied the ship, and whatever was written on the back was incidental. But as I clicked to the next auction, something was bugging me. Something familiar. Something about that last card. Here's the part where you might expect the story to get Really Interesting. Once again, I have to point out that it's only Really Interesting to me, and you might want to just go ahead and check the weather or TV listings before an unwarranted sense of excitement builds. If you keep reading, you are swearing that you do so without any expectations of the slightest bit of entertainment for yourself. And I think, I know that name. I know that name. Images of... New York? Money? I know that name! That woman who sat for Dali, Picasso, and so, many, other, famous artists. That woman whose autograph lists for $4000 in some circles (although doesn't necessarily sell in those circles for that price). That woman who, and suddenly I remembered hearing this anecdote from my mother when I was growing up, once hid her 20-carat earrings in a tissue box while traveling. Alas, she forgot about them, and threw the box (with earrings inside) away. Away, out of the porthole. The porthole of the Queen Mary. The worst part was that there five days left on the auction when I discovered it. Agony! True, the auction didn't mention anything other than that it was just another used QM postcard, but still! Someone might see! Someone might snipe! I bid over the $1.99 price, of course. The day the auction ended, when I just couldn't stay awake, Mike kept vigil and, excited himself, bid up even more. It didn't matter, though; we got it for $1.99! (I was woken prematurely with a big peck on the lips and this dance-footed news.) I was outbid on the other Queen Mary postcard auctions, but not this one! Bad day at Disneyland in January 2008 leads to considering a visit to the Queen Mary instead. Mike brings up a side trip to the QM as part of his pitch to return to Disneyland. 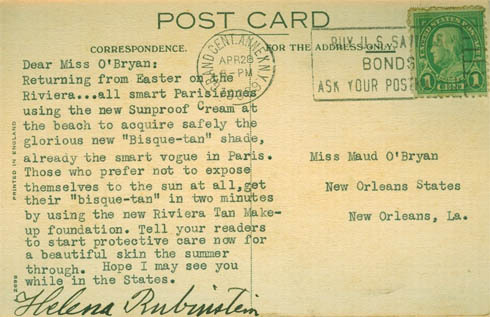 Routine research leads to postcard search which leads to this auction. We now own a fleck of history for under five dollars. SPECULATION: Reading O'Higgins' gossipy biography about the feisty "Princess Gourielli" inspires me to take better care of my skin, which leads to me taking better care of myself, while perhaps even adopting some of Madame Rubinstein's git-r-done gruff charm. I become a better person inside and out. I'm just dying to tell everyone all about it, but it's 2 a.m. on Saturday here and, no, just checked the mail, nothing yet. I can't hit "Publish" and jinx such an eBay coup that has already taken me to such interesting knowledge! But - if you're reading this, that means IT's here!